On June 7th, 1883 photographer Charles Conkling gathered seven of the eight Dodge City Peace Commissioners into a tent. Frank McLean abstained. The man pictured as Frank is M.C. Clark, a “hang-around” deputy from Blue Rapids, Kansas. Frank “Shane” McLean was a wanted man with sworn enemies and would never pose for a high-profile photo. According to family legend, Shane belonged to the secret Order of Illuminati and kept his identity closely guarded. Shane and his family were involved in a vicious blood-feud with Governor Sam Houston, Kansas Senator James Lane and the Freemasons. Frank “Shane” McLean alias: Frank McLane, Lance McLean, W.F. McClain, M.F. McLean, and numerous other dubious names he traveled under. Why is so little known about Frank McLean? 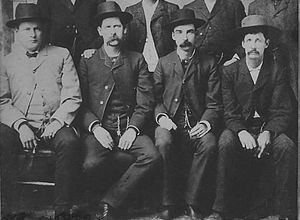 Why did these infamous lawmen pose with an imposter, M.C. Clark? Why would Wyatt Earp allow Frank McLean to be seated beside him? In 1883, Wyatt Earp needed killers to tame Dodge City. Seeking the most fearsome men in the west, he sent Luke Short to Hell’s Half Acre in Fort Worth to find Frank "Shane" McLean. Born in McLennan County Texas, Shane was a Terry's Texas Ranger and fought for the Confederacy at the battles of Shiloh, Antietam and Gettysburg. Quest for Vengeance is the first novel in a series of four inspired by Frank “Shane” McLean’s fifty year quest to hunt down a gang of Jayhawkers, free-state militants, responsible for his father’s murder. Legends of McLean’s violent brand of western justice circulated throughout Texas and the South for years. Descended from the Scotch-Irish Clan of McLean, fighting and killing is in his blood. Shane was a Civil War hero, robbed banks and trains with Jesse James and fought with Wyatt Earp in Tombstone. This is his story, restless, bloody and uncompromising. At sixteen, Shane feels destined for bigger things and grows restless on his family’s Shamrock Ranch in McLennan County, Texas. He covets a commission in Captain Dalryrmple’s Texas Rangers. With the shadow of war on the country’s doorstep, he registers for the Heart of Texas Shooting Contest and uncovers a dark family secret. His God-fearing father Kirby is an Illuminati henchman and hired assassin for the secret society. Born in Scotland, Kirby was sent to Texas by radical Jesuits and ordered to enforce a New World Order in America. Shane is horrified by his father’s past. Kirby kills a cattle rustler along the Brazos River and slits the throat of a renegade Freemason in a Waco alleyway. The dead man has ties to Governor Sam Houston. A staunch Freemason and secret Illuminati, Houston hires bounty hunters from Fort Leavenworth to settle an old score with Kirby. While the gang of Jayhawkers arrives from Kansas, Shane meets the love of his life, Mary Kelly. The red-haired beauty lives in nearby Clifton. Mary’s father promises her to an older man from a wealthy family. As they begin a secret affair, Shane heads to Austin with his family and squares off with the bounty hunters. His father is gunned down on Congress Avenue. The Yankee Jayhawkers evade Federal justice and flee to Missouri. Beaten to within an inch of his life, he vows to kill Sam Houston and hunt down the Unionist soldiers responsible for Kirby’s murder. Shane leaves home seeking justice down the barrel of his father’s gun. The country is embroiled in the Civil War. Needing to bide his time, he joins the elite Terry’s Texas Rangers with three friends. The Special Forces unit is deployed in Kentucky and ordered to wreak havoc on Yankee supply lines. The battles of Shiloh and Perryville leave him wounded and emotionally scarred. His heroic battlefield exploits earn a congratulatory visit from Confederate General Albert Sidney Johnston and a Badge of Service from Robert E. Lee. Following the fierce Battle of Shiloh, Shane struggles with his inner demons. He seeks to escape the war and punish his father’s killers but yearns for home. As he longs to hold Mary, little does he realize his quest for vengeance will last a lifetime. Legend of Shane McLean is one of those books you don't ever want to put down. You should definitly consider purchasing a copy. I know I will. Legend of Shane McLean has a killing on every page and it's loaded with bloody battles between the Yankees and Johnny Rebs. I encourage everyone to read this wonderful Civil War thriller. The best Western I've ever read...a page turner! My heart ached for Shane in his struggle to bring justice to the heinous men who destroyed his family. Quest for Vengeance is a well-written first installment of what promises to be an incredible series. Legend of Shane McLean was gripping form the very get go! It brought history to life with personality. Ian McLean has a true talent and I look forward to the sequel. I couldn't put this one down. Awesome read! If you are a history buff, Ian McLean's first of many is a must read. I couldn't put it down and gave my mom a copy and she stayed up super late to finish it in a day. The writing makes you feel like you are there. Even if you haven't read Lonesome Dove, even if you don't know your outlaw/Civil War/Texas History, you will love reading this book. I cannot wait for the sequel. A must read for history lovers. I couldn't put this book down. Can't wait for the rest of the series. Legend of Shane McLean: Quest for Vengeance is just an outstanding read. I recommend this book.